Sales people are very important. While some manufacturers see reducing headcount of field sales people as a way to cut costs and boost margins, this is a serious risk. We analyzed integrator responses, show why integrators found sales people to be so important, including detailed color commentary. 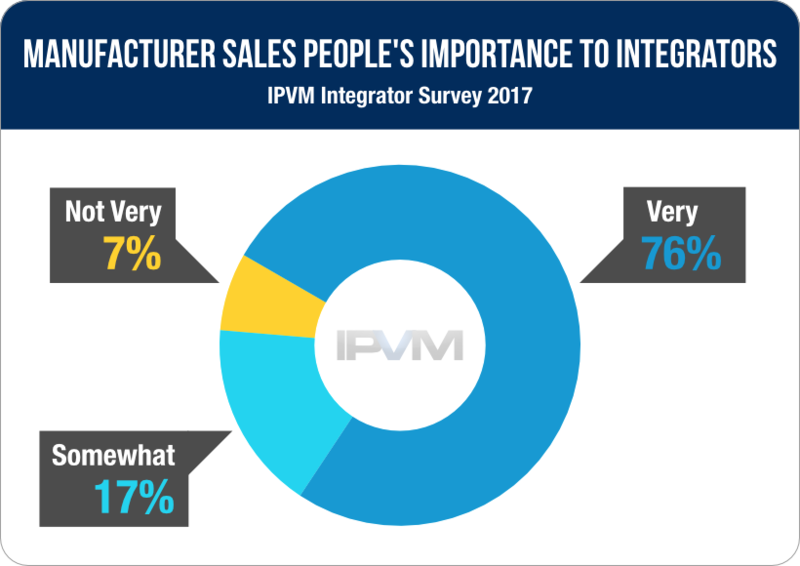 The number one reason integrators cited for the importance of manufacturer sales people is that they would rather do business with people they trust. Many security integrators care more about people than about brands. "We are loyal to the reps who are loyal to us. Service & response when we call is very important to our sales people. We have 1 rep who we know for 20 yrs, who had the Sony line & a VMS line. He spent time building up the market for the manufacturer & then they took the line away from him. Since then they have gone through numerous rep companies in the past 4 yrs. This rep we like, has picked up new lines & we try & lead with those manufacturers. Relationships DO matter." "We are relationship first company so spending time with to discuss market strategy, staying up to date on products and solutions is very important to us." "Relationships are always key in any business. I want to have the relationship in place to not only assist with questions but also to have additional insight." "The larger part of our business will be done with partners that are vesting in building a relationship. Too often the one-off opportunities will distract the less-focused. History with proven experiences have more value. Representatives of a manufacturer or a rep firm will hopefully feel the same. Over time it gets more obvious when they don't." "When the product meets our needs and the relationship is strong it makes doing business more comfortable." "Very, is nice to have a long term relationship with those reps that know your requirements. I hate to start with a new rep over." "I do have companies I work with whose reps I don't know and don't interact with, so I wouldn't say it is vital to have that relationship; but it certainly makes things easier and adds a personal touch that makes me want to use the company more." Sales reps can not only assist with business the integrator finds on their own, but also be a source of new leads, which adds significant value. "Most of our market is "friend" based, it means friends do business with friends, it is important for us to get well with future customers." "A good relationship between manufacturer reps and account managers is paramount for generating leads and keeping up with new products." "A trusting relationship can result in the sales rep/manager providing leads to projects." "If they are out there hustling and trying to drive awareness to the product, then it is very helpful. I find that Avigilon does this very well, they get in front of end users, show demos, and then drive that through the channel. It is a great relationship." "We also appreciate leads from our local sales reps.""Important. It is always good to have a positive relationship. Having a good relationship can lead to added attention and special pricing when needed. Also a trusting relationship can result in the sales rep/manager providing leads to projects." "Important. I need a person who can assist getting things resolved. That may be technical support, design and quoting or getting a spec approved. Bring me a valid lead every once in a while." Even after a bid has been won, integrators rely on their reps to help them with technical issues. "They are very important. They are the ones who are supposed to understand us (or at least try to) and listen to what we want to then match/fulfill our requirements." "They should and typically are experts in their products. As an integrator, I depend on their specific knowledge of their products. I'd say this is a 10 out of 10." "Critical. Field support is non-negotiable when you are doing business with technology both for us and the end user." "They are especially important when issues arrive as they can use their internal connections to remedy the problem." "Very important. We need support and if we can get it then we will continue to buy the products." "We ask them to step in if we are having issues with tech support not being responsive or when we get DOA items that need returned etc." "Very important. Generally it's the fastest method of getting questions answered ... especially when the rep is technically inclined and highly familiar with the line they represent." "The biggest reason I call my reps is to get help on designing a system or to get tech support help when the official tech support has let me down. Often the sales reps know more than tech support or know the right people to field the questions to." Many integrators told us they rely on their reps to keep them informed of new products and incentive programs that may help them win business. "We depend on our reps we deal with to keep us up to date on their products, as well as, industry trends, etc." "It is very important. These are the people that let you know what new products are coming out and whats going away (they're suppose to anyway)." "Important, keeps me educated on the new products and technology." "Very important. It is necessary to have representatives from manufacturers actively seeking meetings with us to inform us on new technology, services, or offers. Email flyers are not effective and we only attend one show a year to hear about new product." "They help keep you up to date on products, programs and company developments that can add to your bottom line that maybe you were not aware of through normal communications." Some integrators mentioned that reps are helpful getting better pricing, especially with larger projects. "It is always good to have a positive relationship. Having a good relationship can lead to added attention and special pricing when needed." "From time to time we need someone to advocate for us. It becomes more important in competitive situations where a manufacturer's discounts may be needed." "Manufacturer reps can be vital to success if they're in tune with your business and they can add value to the process by helping with a BOM, registering a project or providing factory training to the end user." "if the purchase is large enough many of the sales reps have pull and can make pricing happen or get a support issue rolling faster." "Very as I like to get the best pricing possible. They can also help with equipment applications and suggestions." Many integrators told us that a bad rep is as detrimental to a brand as a good rep is beneficial. "That depends on whether the Account Manager can add value through relative industry experience. If not, they are a waste of time as they can cost you through explanation of what you want and how this can be achieved prior to them providing a solution you've effectively produced yourself. It could have been more efficient to order through an online catalog." "One of the reps for a large CCTV company will not assist us because he thinks we should already know everything. I do not sell much of his product, even though it is high-quality and top rated." "A good, interested and invested rep/manager can be very beneficial. A mediocre or bad one can really tank my interest in a business, however, especially when they are unavailable when needed, do not fulfill or respond to requests in a timely fashion, etc., as that makes me feel like my business is not important to the company." "One of the biggest distributors out there has changed our account manager three times in the last 7 years. Purchases from that distributor have varied greatly based on the our rep. Started out great, could call or email and tell them to quote on a bunch of items, had a quote in a couple hours and 90% of the time placed the order immediately. The next guy was a disaster, wouldn't respond to request's for quotes, didn't know the products he was selling... basically stopped buying form them. Now we have a new rep. and he is great. We are buying from them again." "A responsive, knowledgeable, personable sales rep definitely makes or breaks a product line. I find that companies who have quality products and good pricing tend to attract good account managers. I will go out of my way not to sell products from companies with unresponsive sales reps."
"Very important, we need reps to be available and engaged. We had a rep for a major VMS company that was never here, and we were not doing well. He also wanted to pull our dealership. They replaced him in our territory and our new rep is engaged, he is working with us to get and close deals and now we are one of the 20 largest providers for this company in the US." "If the local rep is responsive and helpful it makes working with them easier and quicker. If a rep takes a long time to return communication I sometimes move on to another option just due to timelines." "Extremely important. The account rep can make or break a relationship. I have had extremely close partnerships with manufacturers and a bad rep has completely destroyed that entire relationship with bad customer service and poor responsiveness." "The reason we are still with Arecont despite their early QC issues is on the strength of the local reps and the support they offered. The reason we aren't with Sony still is because the local rep couldn't or wouldn't get us support when we needed it." A consistent theme in the responses showed that integrators strongly value reps that can help them run and grow their business. None of the responses mentioned things like give-aways, free lunches, or other non-business reasons for valuing these relationships. Solid representation in the field builds integrator loyalty, which is a good thing for established manufacturers. However, this also creates a steep barrier to entry for startups in the security industry. Unlike some other industries, where significant business volume can be built with just a website and a "Buy Now" button, the security industry shows it is still very hands-on and relationship oriented. For smaller companies looking to get into the security industry, this requires heavy spending on sales and marketing, which is not always in a startup's budget.